He stopped directly in front of my seat, and I gripped the handles of my bag as my heart beat wildly. The bandit stood so close to me that I could see his eyes through the slits in his mask. They were an icy, pale blue, hard and cold, with little flecks of gray around the pupil and a band of darker blue around the outer edge of the iris. I had never met a killer, but based on every novel I'd read, that was how I imagined a killer's eyes would look. When the bandit stepped toward me, I reacted instinctively. I rose to my feet, swung my bag at him, and then felt the shock go up to my elbows when I connected with his head. The thrill of having my article published didn't change my mind about using my position to repot on the magister. I did waver somewhat, though, when the afternoon post brought a letter from Lizzie, with a banknote in payment for my article enclosed. I supposed that made me a professional journalist. And, quite possibly in the government's eye, a rebel. The riot was close enough now that we could hear the occasional words in the shouting instead of just a rumble. They cried out for blood to atone for the blood the British has shed that day. I jumped at the sound of breaking glass. Olive clung more tightly to me, and Henry put one arm around Rollo and the otters around my shoulders, pulling us close to him. I love alternate history novels. Something about an author taking history and saying "no, this is not how it happened" is kind of neat. 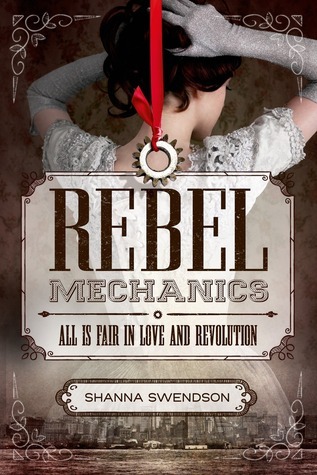 In Rebel Mechanics Shanna not only changes history, but adds a magical element to it: America lost the Revolutionary War because the upper class British citizen (magisters) possess magic. After the death of her mother due to a long illness, Verity decides to move to New York City and become a governess. While on her way to her last interview (and lost hope) Verity encounters a group called the Rebel Mechanics. A group of individuals attempting to build machines and allow the lower classes whom don't posses magic and cannot afford its luxuries an alternate way of life. While their inventions technically aren't illegal, those in power aren't exactly thrilled with them either. Verity eventually finds herself aiding the Rebel Mechanics, a feat easily accomplished after obtaining a job as governess in the home of a high ranking magister. I admire Verity. She is a strong individual who is essentially committing treason and she's only sixteen! Her actions and attitude make it very easy to forget that she is so young as she is exceptionally mature and thoughtful. However, I have a feeling that her actions could have been rather similar to those of actual sixteen-year-olds during the American Revolution. She is incredibly brave and is determined to do what she can to help those in need and fight back against the British crown and magisters. I adore, Henry! As guardian to his two nieces and nephew, Henry is determined that they grow up with the best education, both in terms of intelligence and magic usage. So much so that upon their meeting he informs Verity that he is tempted to dress six-year-old Olive up as a boy so she can get a better education as he cannot find a suitable school for young girls. I mean, how perfect is that? He also has a bit of a secret himself when it comes to the rebel cause (not a spoiler, it's in the synopsis), which makes him all the more endearing. The perk of Verity living in a magister household and working with the Rebel Mechanics is that we get the perfect perspective from both sides of the issue. We see what the magisters think about the Rebel Mechanics, how they use (or don't use according to Henry) their magic, and learn some of their inner workings. With the Rebel Mechanics, we see the truth of the lives the lower class live. We are able to sympathize with the Rebel Mechanics and cheer for them. Not just because they're fighting the man, but because they have integrity and bravery to do what is right for everybody and not just a select few. There are times when the plot moves slowly, but these areas were never long enough for me to want to stop reading. Shanna does an amazing job with creating this alternate history that feels genuine, with characters that only add to the realism. It reads as if it could be part of a longer series, but something about this being a standalone feels right, allowing us to use our imagination as to what happens next.